The KJV is part of a long-standing tradition of Bible translation (at one time known as ‘the English tradition’), which is under attack. It is a tradition which does not seek to interpret the text (although some interpretation is always unavoidable) but to give as accurate a translation as possible of the best text available so that students of the Bible can analyse it and come up with their own conclusions. This is a model which is generally unattractive in a world where churches believe that they know the gospel through the Spirit and only need the Scriptures to confirm what the Spirit has taught them. The KJV has enjoyed tremendous longevity and is a long way from being dead. If nothing else, it is the version that one can bank on being able to obtain unchanged in ten or twenty years. Other versions may be more scholarly, or more easy to read, or bring out the message of their sponsors more effectively; but the English tradition of translation provides a long-lasting standard which it is difficult to replace. It is interesting to reflect on the reasons why the KJV has proved to be such a durable translation. The answer is, in part, because the translators did such a good job. 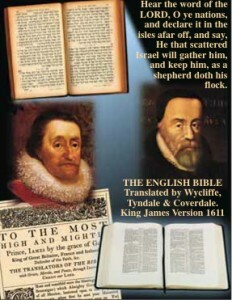 While armies of textual scholars have investigated the text of both Old and New Testaments, they have confirmed that the text known to King James’s men is very close to the original; the differences between the text used in the seventeenth century and that used in the modern day are very slight. In general it is possible to say that the KJV is a translation that can be trusted. More modern versions tend to be slanted by modern theological and critical concerns, and so need to be used with some suspicion. It can also be said that, while modern versions may come and go – and hardly any of the new versions available in the 1980s are still widely used in the twenty-first century – the KJV is a translation that can be relied on to be available for the foreseeable future. The KJV offers a number of benefits to the English-speaking Bible student who has no Greek, Hebrew or Aramaic. It should be used alongside two other versions (for example, the RSV  and the NASB ), so that Bible study is conducted with a working set of three versions. The inclusion of the KJV will give the student several things that are not provided by other versions. The KJV remains the primary English translation for serious Bible study. For those without a knowledge of the original languages of the Bible, the range of study aids available for the KJV far exceeds that for any other version. This is largely the result of the work of Bible-believing nineteenth-century scholars and expositors, which resulted in the concordances, dictionaries and commentaries used by generations of Christadelphian Bible students, and in most cases now also available in electronic format. The use of these aids, combined with the fact that the KJV approximates to a ‘word-for-word’ translation, allows the student to gain closer access to the meaning of the inspired writers. In contrast, although concordances exist for some modern versions, few of these are exhaustive (giving all of the original Greek and Hebrew words, after the manner of Strong’s or Young’s concordances). In the case of those versions using the ‘dynamic equivalence’ approach to translation, their usefulness is necessarily limited by the freer use of language, often paraphrasing the original. (A dynamically equivalent translation, such as the NIV, attempts to translate each thought or phrase into an equivalent thought in English). There is an irony, too, in the fact that the feature of the KJV which perhaps draws the most criticism, the use of the archaic pronouns ‘thee’ and ‘thou’, actually provides an important tool for exposition. The modern English ‘you’ does not distinguish between singular and plural, whereas, in the KJV, ‘thee’ and ‘thou’ are always singular, while ‘ye’ and ‘you’ are always plural. An example where this clarifies the meaning of a passage comes in the words of Jesus at the Last Supper: “Simon, Simon, behold, Satan hath desired to have you, that he may sift you as wheat: but I have prayed for thee, that thy faith fail not: and when thou art converted, strengthen thy brethren” (Luke 22:31,32). This illuminates the desire of the Jewish authorities to divide and subvert all of the disciples, and that Jesus prayed for Petr to be the means of defeating that desire. Whichever version is preferred, it is important that it is read critically, with an awareness that all translations, including the KJV, have deficiencies, as well as passages where translational bias, especially Trinitarian, has affected the text. The vital thing is that the Word of God is read daily and that each believer becomes thoroughly familiar with his or her own Bible, making marginal notes where appropriate to aid recall. It is often very helpful in discussion to be able quickly to find an important reference just by being aware of its position on the page!